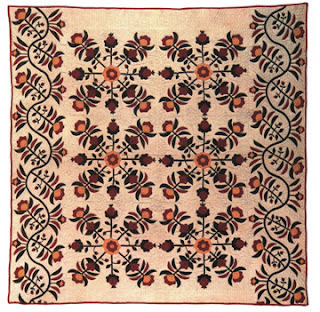 Nancy by Ray Rowden from Deb Rowden's book Quilter's Stories. 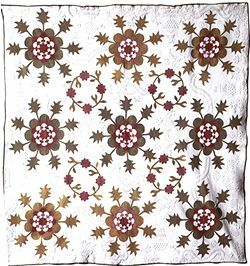 Nancy Hornback, who died last month, was a quilt scholar who changed our views on applique quilts. All these quilt photos are from her chapter in the Kansas Quilts & Quilters book called "Nineteenth-Century Red and Green Applique Quilts." After raising seven children she went back to graduate school in the areas of material culture and women's studies. She focused (she was very good at focusing) on red and green applique and the design and cultural sources. Nancy was instrumental in starting the Kansas Quilt Project and maintaining it. When we began in 1986 we knew very little about what we'd find (although we thought we knew it all.) We found out right away that the red and green appliques that Nancy was looking for weren't made in Kansas. Just realizing that the design was regional was rather monumental. Nancy thought about the color, the symmetries, the images. She traced these to Germanic folk arts. She and I went to Germany looking for antecedents. 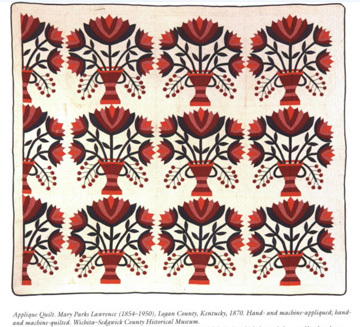 My favorite thing her diligent research found, however, was this photo of the quilt at the top of page by Mary Parks Lawrence. 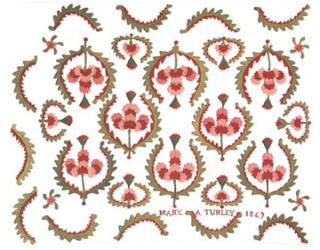 It shows Mary's daughter with the same quilt on the bed. You don't happen across coincidences like that. You work really hard to find them. 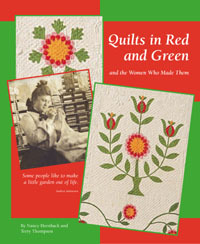 She also made quilts, focusing on red and green applique. 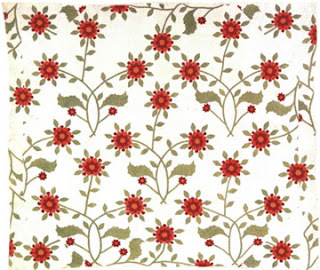 Any time I found a great red and green applique quilt I sent her a picture. I certainly will miss her enthusiasm. Thank you again for this amazing information. 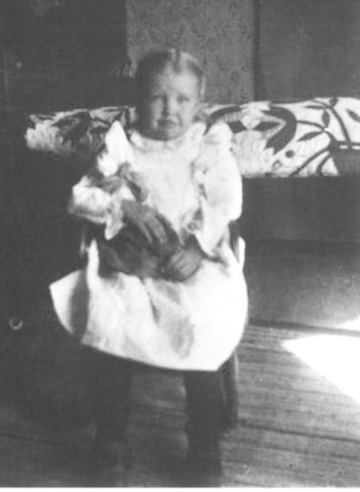 Nancy will be missed, I enjoyed the photo of the child and the quilt. I love the color combo and I can see why the color relate back to Germany. Thanks for all the information you provide. I have become so intrigued by quilt history. I look forward to all your posts. What a wonderful lady. A loss to the quilt world. Barbara, you've done it again! The Metropolitan collection is fabulous and, of course, I want them all! I have both her books and went so far as to email them about how fabulous the book was. 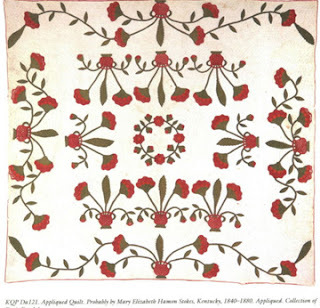 I am amazed at how serious textiles and quilting has been studied and documented, it's a great way to learn some history. 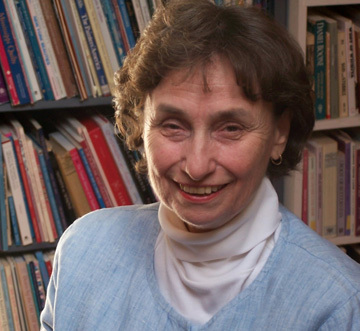 A very touching tribute to Nancy Hornback. Thank you for the lovely story. I learn so much from your blog. Thank you for honoring Nancy, Barbara. She was ever willing to help with research, and her genealogical knowhow was a repeated help to me. That book of which you and she were a part changed my life for the better. Until then, I'd mainly seen "picture books." I loved them, devoured them, but I always wanted to know more than most offered. I wanted historical and material context. My own bent was that of the scholar. And in that book, I found others who shared that bent. I had gone to see Emporia. I ended up discovering a world. 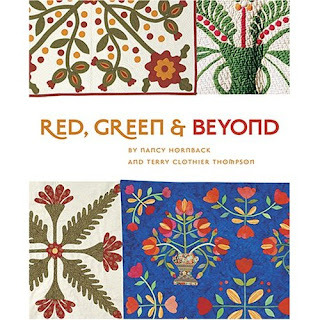 I really enjoyed learning more about Nancy and I do love red and green quilts. I have never heard of Nancy though I have one of her books. Thank you for bringing her memorial contribution to the notice of those who didn't know her. I am in awe of these quilts and am so grateful to you both in making them available for the world to see, from Downunder with school colours of red & green. I met Nancy Hornback briefly at 2001 AQSG Seminar. I had a young friend with me who knew Nancy only thru the Internet. I was greatly impressed at Nancy's charity and kindness in welcoming my friend and giving her the confidence to stand up and present her quilt at the show and tell in front of all these experts. My friend could not have done it otherwise. Nancy must have been an extraordinary person, and I was sorry to learn of her passing. 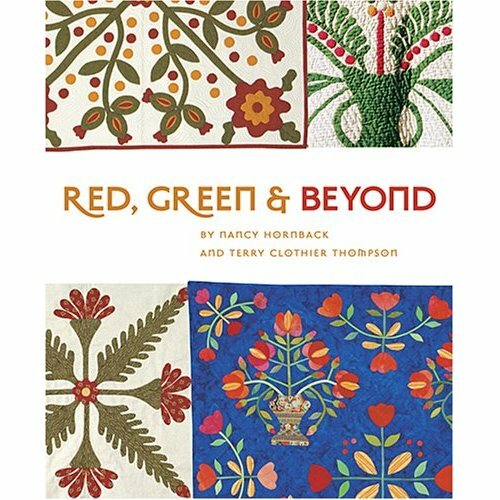 I am a huge fan or red and green antique appliqué quilts and always loved seeing Nancy's antique quilts and these two books are among my favorites. What a wonderful blog post and yes she will be missed.